Professor Tom McLeish is an unusual physicist because his academic output at Durham University includes both history and theology as well as lab-based and theoretical physics research. 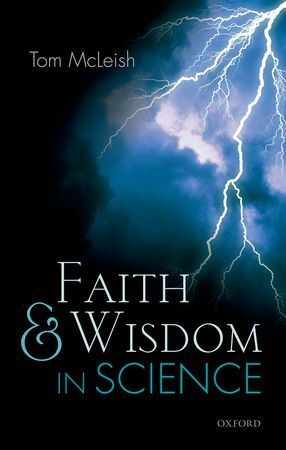 He has been involved in setting up teams of scientists and medieval scholars to look at scientific thinking in 12-14th century texts, and his latest book, Faith and Wisdom in Science, is on the theology of science. McLeish gave a seminar at the Faraday Institute last week in which he laid out a manifesto for science from his own perspective as a Christian. What he said is relevant for anyone in our society today, regardless of their beliefs. His starting point – a survey of medieval texts – is unusual, but a story demonstrates why the work of these ancient scholars is important. Anyone who has learned first aid will be familiar with the scenarios that are part of the exam. You walk into a room full of people who are injured in some way, and you have to prioritise who to treat first. The noisy people will probably be alright for a while, but the silent ones – those who for some reason have no voice – need to be given urgent attention. McLeish said that the same principle applies in science and religion, and I agree. There are little-known areas of history, biblical studies and science that need our attention. The scholar who is willing to explore these fields will be rewarded with some fascinating findings. There are also troubled discussions around science and technology today that don’t cry out that they are about “science and religion” but won’t make progress without a theology. McLeish described some work that social scientists have done to examine the public debates over nanotechnology. The science of nanotech may be new, but behind the debate are some very old and very negative myths about the relationship between science and society. This made McLeish wonder whether there is a better overarching narrative for science, and he found it in the writings of the 7th-8th century monk and scholar, the Venerable Bede. Bede wrote a book on science that was somewhat unusual for its time. Instead of including the symbolism and moralising that his contemporaries used, Bede focused on the details of how things worked: the water cycle, the stars and planets, and geology. His aim was to help people not to be afraid or superstitious about the world, and also to help them to wonder. In encouraging people to learn from nature, Bede was drawing on the biblical wisdom literature. For example, God speaks in the last four chapters of Job about his role as creator, using natural events to demonstrate his power, and announcing questions rather than answers to urge Job into exploration. Reading passages like this, the medieval theologians reasoned that studying God’s works was a way to learn wisdom. So when Aristotelian scientific texts were brought to Europe later on in the Middle Ages and translated into Latin, the church embraced this new form of learning wholeheartedly. The New Testament describes a ‘ministry of reconciliation’ for Christians, so these early scientists saw themselves as mitigating the effects of the fall – healing the broken relationship between us and the world. McLeish’s own theology of science follows this pattern, bringing together both work and love, and using the creative questioning of modern academic research. He recognises that any engagement with nature will be both ambiguous and painful, but is hopeful that we can indeed reimagine our relationship with nature – that fruitful balance of order and chaos seen in the book of Job. So what are the consequences of this new manifesto for science? Nature is not sacred, with pre-determined histories or boundaries, but something to be explored and used wisely. Our intellectual relationship with nature can be therapeutic, helping us to conquer fears and wonder at the things we see around us. We have art or music therapy, so why not science therapy? Finally, the church can learn to celebrate science, and the role it has to play in the world – a topic that will be covered here in a couple of weeks. Thank you – that sounds like an interesting book, and I will take a look at it!